Daniel is paying me back for having to fill in for me last week by pretending that he’s sick. So I am filling in the slacker spot. Actually, the poor dude has it pretty bad. He may not even be around next week. Someone send him a bigass cookie. I will be bringing you guys the pre-release review of J. Fuego’s “Sangre De Toro” or “Bull’s Blood”. The Good Stuff: These cigars were graciously sent to us by J. Fuego himself. I really don’t know much about this blend other than the useful information that Brian Hewitt from Stogie Review was able to coax out of Mr. Fuego. 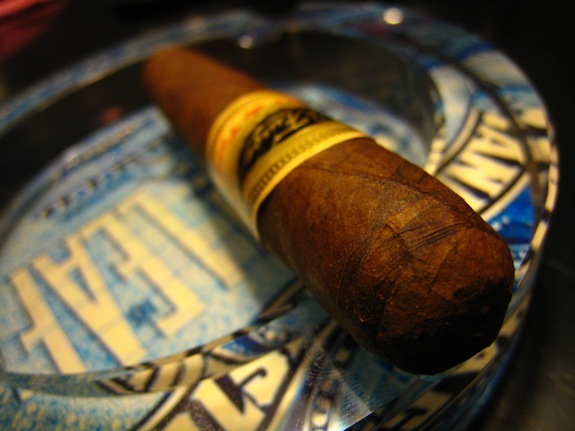 The Blend will sport full Nicaraguan tobacco. Starting with the Nicaraguan Colorado wrapper, then onto the Nicaraguan Criollo Binder, before ending with the Nicaraguan Criollo and Corojo Filler. These cigars will run from $5.95 to $6.95 and will begin to hit stores early next month. Prelight: Ever since I read Brian Hewitt, of Stogie Review’s take on this cigar I had been wanting to get home and see just how much this cigar really smells like a pickle. Yes, I couldn’t wait to get home so that I could smell a pickle. So what. Anywho, It’s just nuts that this cigar, really does give off a pickle scented aroma! Even more crazy is that Brian picked it up so quickly. Well done sir. Outside of the pickle aroma there is a slight floral mixed in, and only a slight tobacco scent coming off the foot. 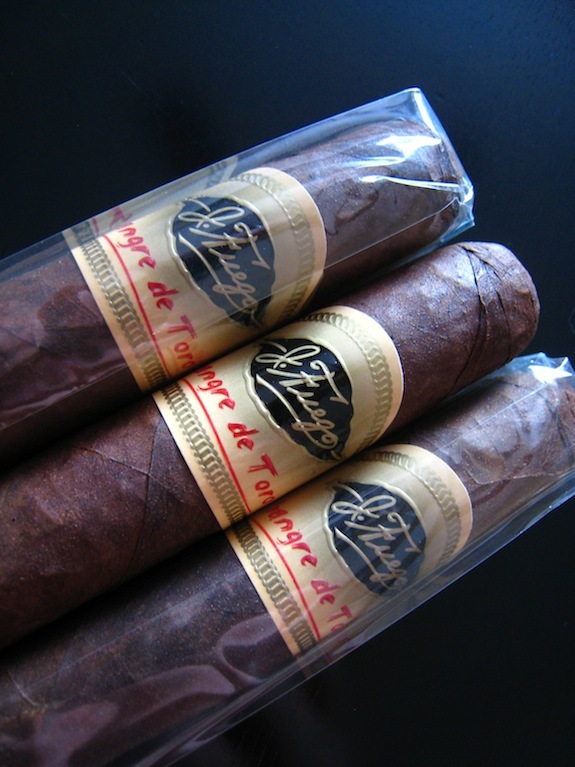 The wrapper of the cigar is a very dark, very consistent dark brown. There are a few veins, and no soft spots heading up to The Sangre De Toro’s round, triple cap. The Sangre De Toro clipped clean and easy with my Palio double bladed cutter. 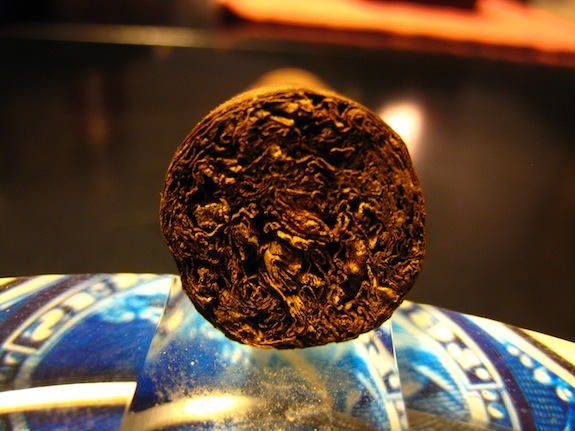 The cold draw produces nothing more than a really natural tobacco flavor. I took a couple of extra draws, just to see if the pickle aroma transpired into the flavor. Luckily, no dice. Halfway There: Two thirds into this Sangre De Toro and the pepper has started to sneak back into the mix. The Chocolate has also increased followed up by some nice espresso notes. There was mention of how flavorful this wrapper is, and its really starting to show. The burnline has completely corrected itself and is now burning dead even, and very thin. 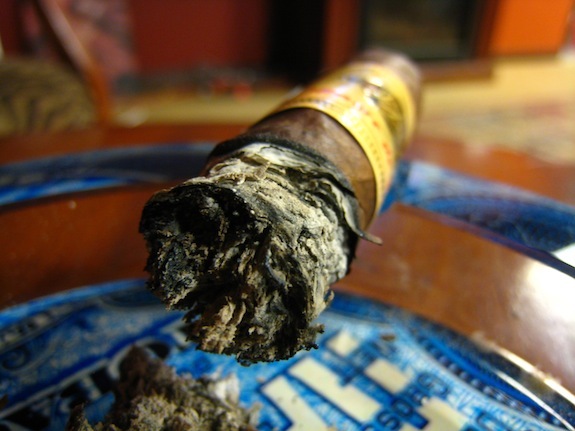 There is a bit of body coming off this cigar. With a name like “Bulls Blood” I shouldn’t be surprised, but most of Fuego’s cigars that I have had, have lacked in the body department. So far this stick is dead on. The retrohale is really sharp, and I don’t find myself doing to too often. The retrohale leaves a really spicy, peppery prime behind. 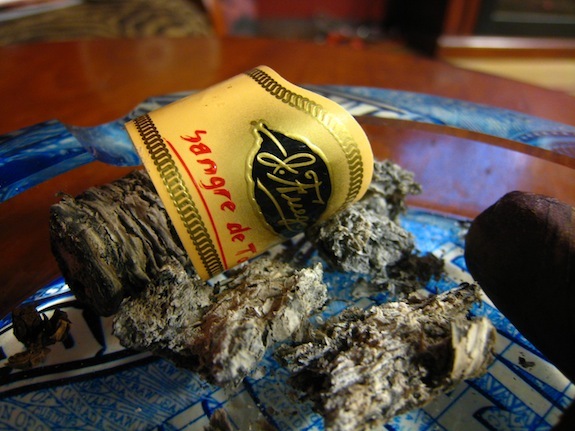 Finish: The Flavors in this Sangre De Toro just keep piling on. Early into the final third the main contenders was a ton of cashew and peanut, mixed with a very perfume type flavor, backed by some dark chocolate. 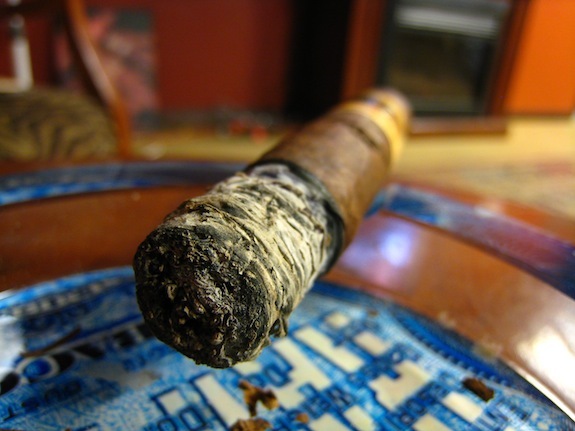 I know I touched on the body of this cigar, but it really never got more powerful than a medium for me. I was expecting a bit more, but I am glad that it finished off so smoothly. No harshness, no dryness. Just a smooth finish. 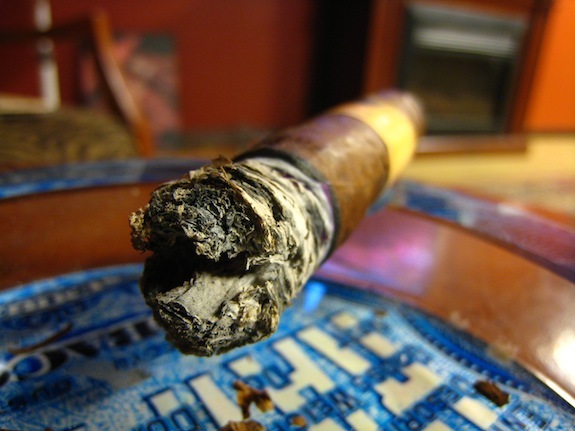 Overview: This cigar was dead on. From the price, to the burn, to the tons of flavor J. Fuego made yet another winner. 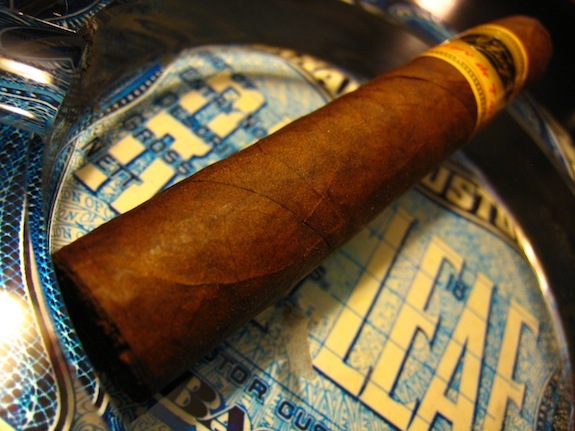 This cigar is ideal for the seasoned smoker who doesn’t want to shell out a lot of cash. In the same rite, it’s a perfect step up for the novice smoker, and won’t break the bank. This is VERY box worthy and I know it will find a happy home in my everyday rotation. Sorry, no pairing this run. I had a bottled water. It was a spur of the moment review so I didn’t really have time to get some good brew going. But I’ll make it up next time I swear. awesome review, sounds like a good flavorful cigar and i’ll have to seek them out when they hit shelves. The photos were top notch Tony, keep up the good work! Tony what can I say but another awesome review. I have not had or seen these and sound like a smoke I need to try. Nice stuff. I have only had the -777- from Fuego. Will need to invest more time into his sticks. Nice pics, and sometimes water isn’t the worst thing you could be drinking… Like a wine cooler or Zima…..or one of thos little Jack Daniel Lemonade dealios….Maybe I should send some of those up to the big baby in Canada…..
Nicely done Tony, sounds like a damn tasty cigar that I will need to seek out when it comes around! DannyP6228 swears by his 777’s just as Tadd mentioned. Fantastic review. First time I have heard of these and your description has added this to my must try now list.